Daughter of piano teacher Friedrich Wieck, who started teaching her when she was only five years old. She impressed her surroundings by playing difficult piano pieces by head when she was sixteen. 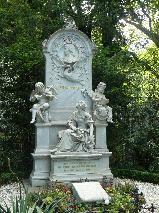 In 1828 she made her public debut at the Gewandhaus in Leipzig. In the same year Robert Schumann started piano lessons with Friedrich Wieck. Clara and her father went on concert tours to Hamburg, Paris and other cities. Clara and Schumann started to spend more time together and Wieck tried to keep them apart by taking her to Dresden. They entered into a secret engagement on August 14, 1837 and on September 13, 1837 Schumann asked for her hand. Wieck refused boldly and Clara left for Vienna where Emperor Francis I called her 'Wundermädchen' (wondergirl). In 1839 Clara asked for legal permission to marry Schumann and on September 12, 1840 they were finally married. They travelled to Russia in 1844 and to Vienna in 1846 for concerts. In 1849 they had to flee dresden for the revolution, Clara being pregnant of one of their eight children. In 1850 the Schumanns moved to Düsseldorf. By 1854 Schumann suffered from a mental illness and he died in 1856. Clara's contacts to the young Johannes Brahms, whom she had met in 1853, became closer and he was probably in love with her (later he had his eye on her daughter Julie but Brahms was very unlucky in love). Details are unknown because Clara and Brahms destroyed the letters they wrote to each other between 1853 and 1858. Certain is that he lived with her in Düsseldorf for a while. Clara sent most of her children to relatives. She moved with her children to her mother in Berlin in 1857 and Lichtenthal (now part of Baden Baden) in 1863, where she lived until 1873. Several succesful concert tours followed. In 1864 she toured Russia once more. Like her husband when he was still alive, Clara didn't like the music of Richard Wagner. She called the enthousiasm for his music 'a disease that sweeps across a country and takes away the best people'. In 1882 she attended "Das Rheingold" but it bored her. In 1873 she moved back to Berlin. From 1878 onwards she lived in Frankfurt am Main, where she became the main piano teacher at the new conservatory. In Frankfurt she gave her last concert on March 12, 1891. She died in 1896 after suffering two strokes. 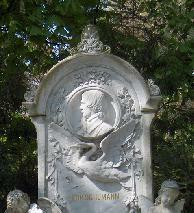 Robert and Clara Schumann's grave at the Alter Friedhof, Bonn. The house of Friedrich Wieck at what is now called the Wieckstrasse (number 10) in Loschwitz, Dresden. Here his daughter Clara met her future husband Robert Schumann. Clara Schumann painted by Franz von Lenbach when she was nearly 60 years old. 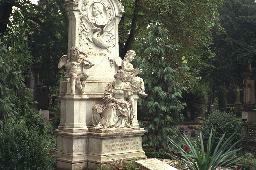 The grave of Robert and Clara Schumann at the Alter Friedhof, Bonn. 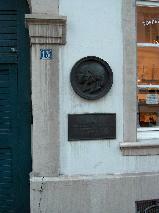 Plaque at Bilkerstrasse 15, where Robert and Clara Schumann lived in Düsseldorf.